Science communication – what’s in it for the scientist? 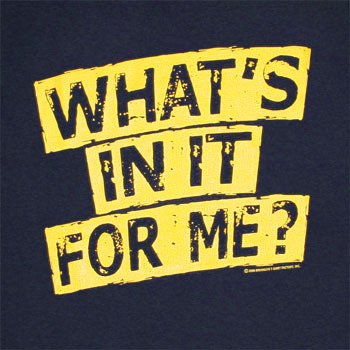 what’s in it for science? Communicating science is so often focused on transferring knowledge from experts to members of the public. More and more often it is also associate with engaging and communicating with the public. But still with a focus on what the public or the common man gets out of this. But what’s in it for the scientist? How can science communication benefit the researcher personally? Is it just a waste of time and a burden? I have later on come across the two articles below, which focus on the costs and benefits of research communication. Both, however, put most attention on the costs and the potential benefits of alternative models for scholarly publishing (e.g. open access) and focuses on to a lesser extend on the benefits of the actual communication of science. Therefore: In preparation for the course it would be great to receive some inputs from you people out there on how communicating your science has helped YOU. What have the benefits been for YOU? Do they out-weigh any potential disadvantages? If your research could talk – what would it say it got out of you communicating? Hints to blog posts, book chapters, articles, podcast etc. focusing on this or just your own testimonials will be highly treasured! And will of course be fed back through this blog. 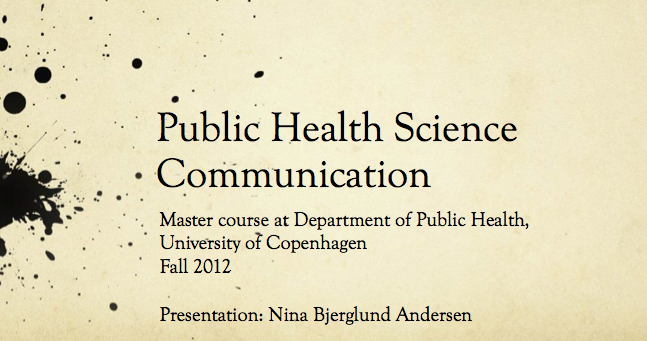 The second module of the course in Public Health Science Communication focused on Translating Science to Traditional Media. On paper a nice and concrete topic – but both choosing literature for the syllabus and preparing for the class proved a little bit more challenging. Because what does ‘translating science’ mean? And is there a recipe for doing so? The simple answer to the last question is: no. There is no formula to follow or an optimal way of doing it. 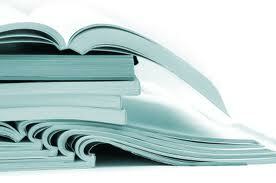 It depends on the scientific topic, the scientist, the context, the targeted audience and the chosen media. This was one of the take home messages for the students. Not a very helpful message I fear. Hopefully, they did get something out of the module despite the lack of clear-cut facts and recipes. As a theoretical background, the students were presented with some perspectives on historical developments in the theories of public communication of science. The idea was to show the students how motivations behind communicating to the public had changed over time, and how the perception of the public influences how and why scientists communicate. For me personally, understanding developments in different approaches to translating science helps me think about how science can be translated today. The power of ‘framing’ in translating science and reaching target groups was also talked about. The article by Myers, Nisbet et al A public health frame arouses hopeful emotions about climate change gave a nice public health context and demonstrated the power of health topics which is something all people can relate to. It was however just an appetizer for the extensive ‘framing’ approach. 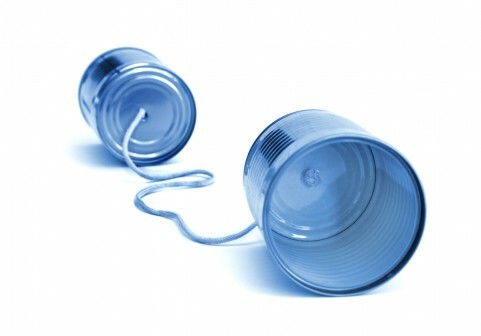 We also had a nice discussion about whether and why scientists should communicate to the public. And what advantages the scientist may have for communicating (as the common perception is that scientists are bad communicators). The discussion was helped along by the article Of course scientists can communicate by Tim Radford. Again, there is no right or wrong answer for this, but the discussion gave a good feel for the challenges in translating science, but also some of the mechanisms that could help this communication along. Some more examples were shared by readers of this blog in the comments section. Thanks to all, and keep’m coming. Although the course is not a practical communication or writing class I chose to spend some time on some basic communication tricks. Tricks that I was introduced to at the Danish School of Journalism and which I have found useful – especially for my written language. 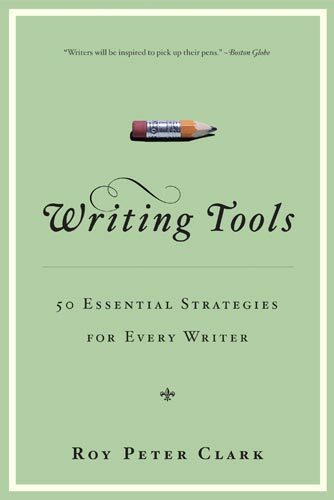 Many of the concrete writing tips can be found in Roy Peter Clark’s book Writing Tools – 50 Essential Strategies for Every Writer (short online version is available and podcasts). Simple things like thinking about making your verbs active, choosing your verbs with care, walking up and down the ladder of abstraction, remembering the inverted news triangle, reading your text aloud while walking etc. It was all a bit rushed and a whole writing course would have been relevant – but unfortunately it could due to time restraints only be an appetizer.